With the shadow of Citi's global woes looming large, the uncertainty was taking its toll at the top. Is the best over with the worst for Citi in India? Among the flock of global banking CEOs clocking up frequent flier miles on India visits, there is one conspicuous absence - Vikram Pandit, head of Citigroup. The Nagpur- born CEO whose parents stay in India has more than one reason for hopping onto an Indiabound flight. A big reason - Citi's leadership position among foreign banks in India. The biggest reason - that leadership position is under threat. That should have brought the 53-year- old Pandit to India. But Pandit has his hands full fighting various fires at Citi's New York City headquarters. Since the credit crisis unfolded, Citigroup has bled cash and only a government bailout ensured its survival. Today, it is marginally profitable, but its accounting standards have come under the scanner. In India, Citi's predicament is different. It's bleeding talent. Citi India's frontman for six years, Sanjay Nayar, left two months after the Lehman crisis hit the global markets. His surprise successor, Mark Robinson, a New Zealander who was heading Citi's Russian outpost, spent just 15 months in the corner room. Pramit Jhaveri, the third CEO in two years at Citi India, doesn't think it's unusual that Pandit isn't Indiabound. "Emerging markets are at the forefront of Vikram's growth strategy," he explains. Jhaveri, an investment banker who was away from commercial banking for a decade, says of his first five months as CEO, "It could have been worse." With the shadow of Citi's global woes looming large, the uncertainty was taking its toll at the top. V. Srikant, who was heading the markets for South Asia, joined Reliance Industries Ltd as deputy chief financial officer (CFO). Nalin Nayyar, who was in the equity raising group left for Religare and V. Dinesh, head of global transaction group, also quit the bank. And CFO Abhijit Sen announced his decision to leave the bank to join former CEO Nayar, who had moved on to head private equity major Kohlberg Kravis & Robert's India operations. There was neither an HR head nor a country risk officer. "My own role (investment banking head) had to be filled," points out Jhaveri. Nagpur-born Citigroup head Vikram Pandit, who has hands full fighting various fires at Citi's New York City headquarters, has been conspicuous by his absence from India. Jhaveri's immediate problems had little to do with the global crisis but with India's own predicament in consumer banking. Revenues from retail banking slumped from Rs4,004 crore in fiscal 2009 to Rs3,002 crore in 2010. With bad loans increasing, Citi, like many other banks in India, was forced to shrink its retail book. The consumer arm's woes have pushed net profit down by a whopping 60 per cent from Rs 2,173 crore in 2009 to Rs860 crore a year later. 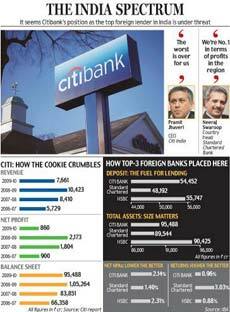 Citi's India balance sheet has shrunk by close to 10 per cent from Rs 1,05,264 crore in 2009 to Rs 95,488 crore in 2010. Revenues fell from Rs10,423 crore to Rs 7,661 crore over the same period. Fresh non-performing assets ( NPAs) additions were in the region of Rs 327 crore in fiscal 2008. By 2009, they had climbed to Rs 2,514 crore, and stood at Rs 2,394 crore a year later. "There has been a period of pain for us," says Jhaveri, who believes Citi can now move away from restructuring, and look forward to growing the balance sheet. But that period of pain may have been enough to give his closest competitor a chance to sneak a foot in the door. " We are No. 1 in terms of profits in the region," says Neeraj Swaroop, country head at Standard Chartered Bank. Stan- Chart clocked a net profit of Rs 2,127 crore as against Citi's Rs 860 crore in fiscal 2010. For Citi to lose out to Stanchart on the profit parameter is a blow, but Jhaveri points out that one swallow does not make a summer. " Let's look at the race as a marathon," says the India CEO, who never leaves a meeting without attempting to sell a credit card. That business is key to Citi - it ranks No. 3 in the volumes of cards sold with a market share of 11 per cent. The big question, however, is will Citi be able to return to its glory days? " The worst is over for us," says Jhaveri. The bank has a comfortable capital adequacy ratio ( CAR) of 18.14 per cent against the Reserve Bank of India- stipulated threshold of nine per cent. " Capital is not a constraint," says Jhaveri who got fresh capital of Rs 1,200 crore from the headquarters this year. In addition, there are profits generated in the Indian unit, which have not been repatriated. "Whichever part of the business you look at, customers are at the heart of Citi's business. "As long as you retain the notion of clients, excellence and service, banking is not a complicated business." Then again, it never was.